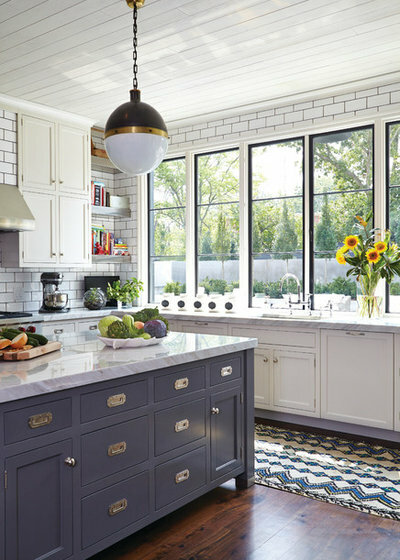 Have your kitchen cabinets gone from new to vintage to what you consider an eyesore? Does it feel like you should be wearing bell bottoms and a butterfly collar when you’re reaching for a plate? If you said yes, perhaps it’s time to admit your cabinets need a refresh. Getting a new look doesn’t have to set you back thousands of dollars. 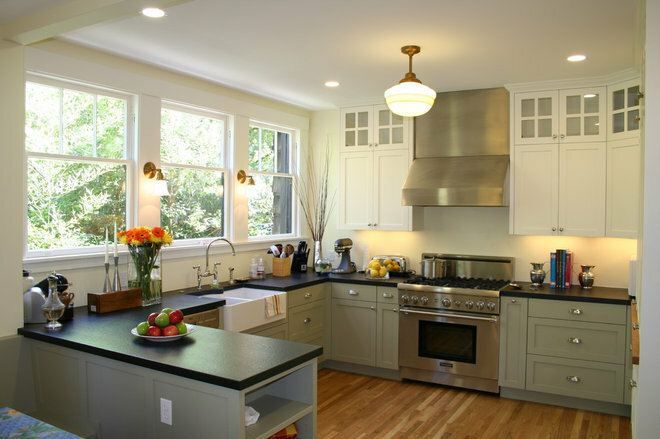 Instead, consider how paint could transform your kitchen cabinets. 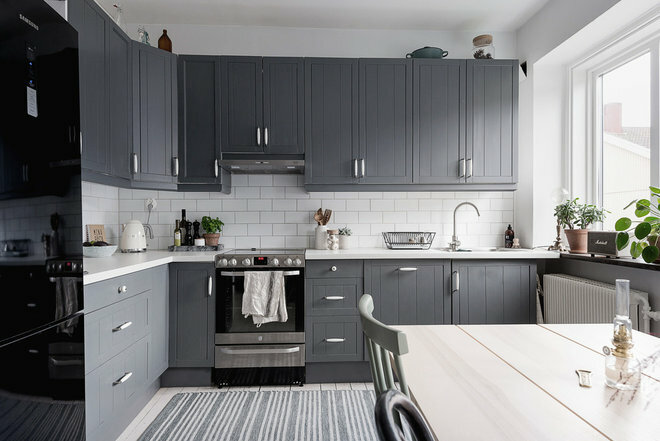 Let’s take a look at when paint works, what colors of paint to use on your cabinets and how to paint your kitchen cabinets yourself. Should You Repaint or Replace Your Kitchen Cabinets? Before you begin repainting, first analyze the “bones” of your existing cabinets to make sure they are in stable enough condition to repaint. Chipping or cracked wood or water damage are warning signs that they might need to be replaced, not just repainted. Additionally, if the cabinetry does not function well enough for you and your family to use, you may want to also consider replacement. If you determine your cabinets are in good condition but simply need a refresh, you are a prime candidate for cabinet repainting. 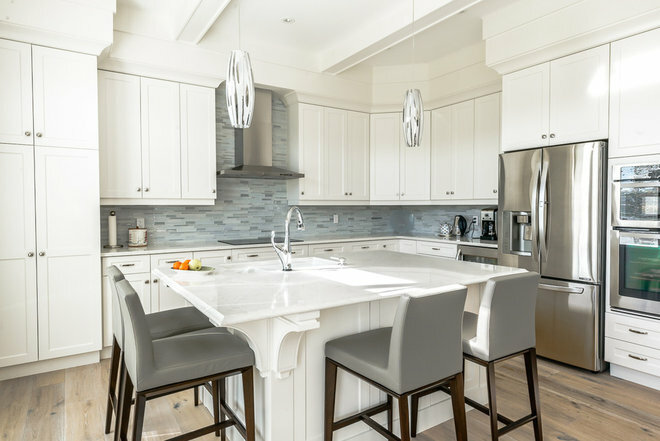 Kitchens are the gathering place in the home, so you want to be sure the overall design is welcoming and reflects the aesthetic of the house. 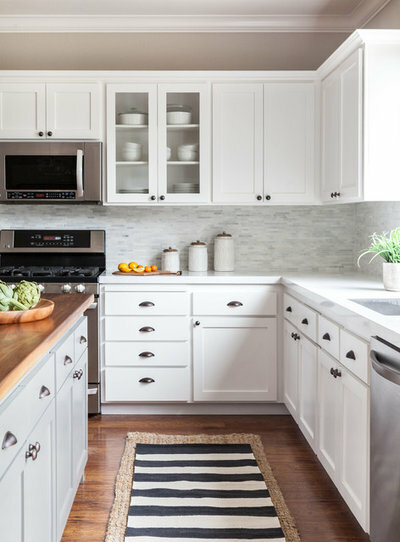 For cabinets, many times I find that neutral paint, such as white, beige and gray, will give your kitchen a welcoming and clean look. You can also paint in more than one color to reflect your style. The island is a great place to bring in a bright or moody color. This will turn the island into a focal point. Another option is using two-tone combinations to add a little bit of drama and contrast. 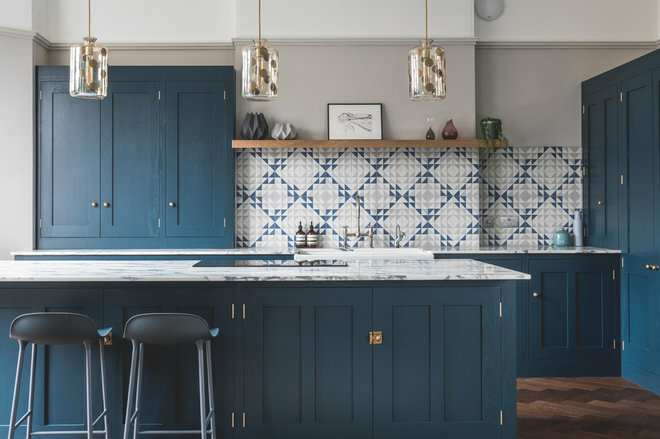 When incorporating a two-tone color design, always be sure to anchor the kitchen by using the darker color on the bottom cabinet and lighter on top. Pro tip. I’ve used paint colors like Benjamin Moore’s North Sea on the bottom portion of the cabinets and then Meadow Mist on top, or Sherwin-Williams’ Cityscape below and Alabaster above. Going the DIY route will most likely save you money, but it will take some time and patience. 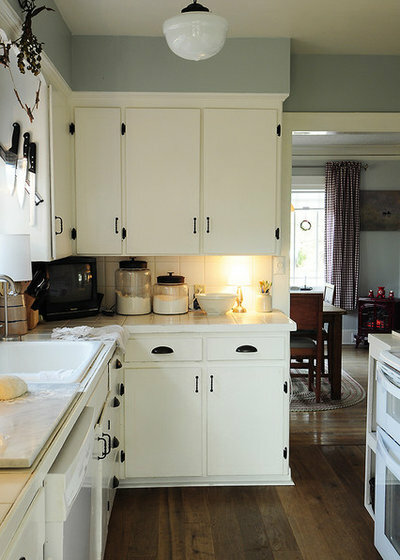 Here’s a step-by-step look at how to repaint your cabinets and have them looking great again. 1. Prep kitchen and painting area. First things first: Protect your floor from dripping paint with cardboard or cloths. 2. Dismantle cabinets. Remove the cabinet doors and front parts of drawers as well as any knobs, hinges, latches and other hardware with a screwdriver. Make sure to keep the hardware and cabinets organized and easy to locate for reassembling at the end of the project. Pro tip. Use a pencil to number your cabinet drawers and doors for easy reassembly. 3. Clean everything. Scrub all parts of the cabinets to remove any contaminants from cooking or otherwise. Some options include a chemical cleaner such as a TSP substitute or several drops of dish detergent in a half-filled bucket of water. Alternatively, use a couple tablespoons of distilled white vinegar with a gallon of water. 4. Sand. Smooth out the cabinet surfaces with fine-grit sandpaper and clean them with a clean tack cloth. Then, vacuum away any dust as best as possible to ensure a clean surface. Pro tip. You don’t need to sand all the way to the bare wood, as some preexisting paint can remain on the cabinet prior to repainting. 5. Apply first coat. 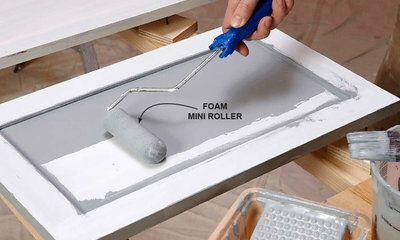 Apply a coat of primer-sealer to all of the cabinet’s doors and siding. This will ensure the paint bonds well to the wood. The best options for primer include a shellac-based primer, such as B-I-N, or an oil-based primer. Both of these will also help to prevent darker wood from showing through. If necessary, a second coat of primer can also be applied. Pro tip. You’ll want to sand between coats of primer as well as between coats of paint. 6. Paint with a top option. When choosing the paint, you want to make sure you use premium-quality paint. Many pros recommend Benjamin Moore Advance or Sherwin-Williams ProClassic, which come in a variety of finish options. Although this paint is more expensive, you don’t want to skimp out on the paint quality, especially if you are going the DIY route. 7. Paint again. Repaint the cabinets with a brush, followed by a foam roller to ensure there are no visible brush marks. 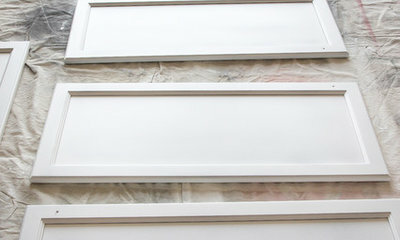 Make sure to paint the doors and drawers outside to mitigate the amount of fumes circulating in your home. Pro tip. If you have a little more room in your budget, consider using a professional spray gun. A specialist at your local hardware store can recommend the right tool for your needs. 8. Finish up. Reattach the doors and reinstall drawers once the paint has dried completely. Then, reconnect everything with a screwdriver, which should be simple if you organized the hardware when first removing it. If you’re unsure how to inspect or paint your cabinets, consider hiring a professional for the job. Regardless of who is doing the work, good luck with your kitchen update and happy remodeling! Your turn. Have you painted your kitchen cabinets? Show us how they look by sharing a photo in the Comments.